This upcoming Sunday, March 4, 2018 is the 90th Academy Awards with Pixar Animation Studios honored in three different categories - Coco: Best Animated Feature and Best Original Song, LOU: Best Animated Short. In celebration of the highly anticipated award show, the Academy held their annual Oscars Week panel discussions – kicking it off with the filmmakers honored in the Animated Shorts category. Taking the stage alongside fellow nominees were LOU director, Dave Mullins and LOU producer, Dana Murray. The duo chatted with the moderator and audience about their filmmaking process – with Mullins sharing a personal note on how the conflict in the film hit home for himself and Murray, "You get this character (LOU) and discover – that you know, a lost and found box is meant to give things back to the original owners and a good story needs conflict, so the best conflict for that is a bully. When you get that character (J.J.) in there we found that's when the heart of it came together. You know, both of our kids dealt with bullying at school and we've had to talk to our kids a lot about that and so, it all just rang true for us." As their portion of the panel concluded both Mullins and Murray applauded members of their team who happened to be in attendance, Editor Tony Greenberg, Camera Director of Photography Adam Habib, Simulation Supervisor Henry Dean Garcia, and Assistant Editor Katie Schaefer Bishop. Watch the complete panel discussion below. In addition to the celebration of Oscar Week, the Academy took their annual graduating class photo honoring the nominees during a special luncheon. Pictured below are Pixar nominees, Director Lee Unkrich, Producer Darla K. Anderson, Director Dave Mullins, Producer Dana Murray – as well as, songwriters Kristen Anderson-Lopez and Robert Lopez (nominated for Best Original Song, "Remember Me"). 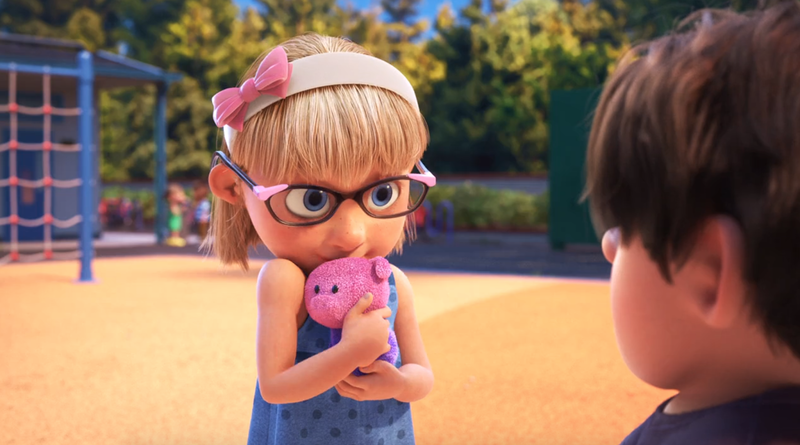 One thing we love about Pixar films is being immersed into a world that is either familiar or fanciful – in LOU, we're transported into the familiar setting of a schoolyard playground. That immersion into the world is created by the talented artists who add details such as scuffed playground slides, aging basketball court lines, and of course, the dust lingering in the air lit only by the streaming rays of sunlight. 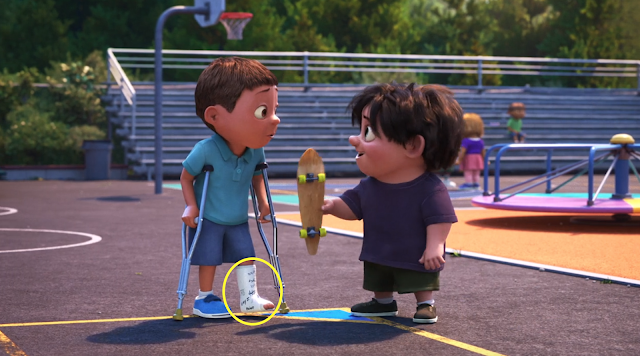 Those details can often hide some of Pixar fans favorite things – Easter Eggs! Though LOU is a short film, there is definitely no lack of easter eggs hidden in the film. In fact, Director Dave Mullins gave his daughter a sweet 'animated' cameo in the film (see photo below). With help from Production Designer Albert Lozano, Supervising Technical Director Gary Bruins, and Modeling and Rigging Lead Sajan Skaria, the team was able to create a look-alike version of his daughter – complete with her "Piggy" plush (as Mullins noted has been with her since she was a little girl). The storyline surrounding LOU features a bully named J.J., who Mullins shared (during the 2017 Disney Social Media Moms Celebration) was named to honor his mother, Joyce Jean. Though J.J. seems to have Sid-like qualities as he snatches toys from other kids around the playground, he definitely does not resemble the 'Toy Story terror' in the physical sense. 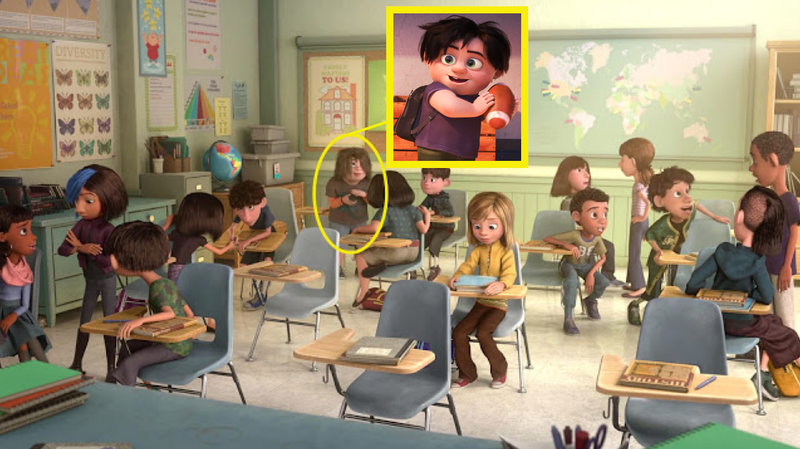 Mullins explained, the production team reworked some of the kids from Riley's classroom in Inside Out - creating younger versions of them (including J.J. – see photo below). 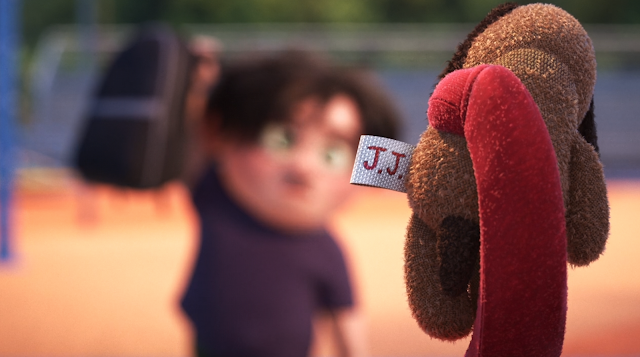 As the film takes an emotional turn, as Lou spots a familiar pairing of letters, as he and J.J. wrestle for the backpack. This prompts Lou to fly into the Lost & Found box and immediately present a long-lost item belonging to J.J. This impeccable penmanship on both J.J.'s underwear tag and his puppy have a personal connection to director Dave Mullins, as it was written by his wife, Lisa Mullins. The image below not only showcases the aforementioned hidden detail, but it also contains one of my favorite technical/simulation effects – being the pilling on Lou's arm (sweatshirt sleeve). Again, as Pixar immerses us into a familiar world in LOU, we can all relate to having that one sweatshirt that is so beloved, so cozy that pilling is just inevitable – and for me personally, this particular scene defined the character Lou – making him more lovable (knowing that he was in-fact, a well-loved sweatshirt). Lastly, towards the end of the film as J.J. returns all the items to his classmates, we notice a boy with a broken leg on crutches. If you look closely you may recognize some of the signatures and names written on the cast (see photo below). Mullins shared with us that indeed, those signatures are those of the crew – including a sweet message signed by Mullins himself, "DM + LM"(inscribed in a heart) as a loving gesture to his wife, Lisa. Congratulations to the entire LOU team, we'll be rooting for you this upcoming Sunday. Be sure to share your thoughts with other Pixar fans in the Pixar Post Forum. Dave Mullins and Dana Murray share insights into the making of Pixar's short film, Lou at the Academy Award Animated Short Presentation.